From the moment he took office, our lawyers have been working feverishly to oppose every attempt he's made to worsen climate change, kill wildlife, endanger public health and destroy public lands. So far the Center has filed 123 suits against Trump. Read on for details on every single one. Join us to stop Trump's rollback of protections for wildlife, public lands, our climate and communities. The Center for Biological Diversity sued the U.S. Fish and Wildlife Service for failing to release public records on President Trump’s plans to build border walls through protected national wildlife refuges. Trump plans to build new, or newly fortified, border walls through at least six refuges that preserve some of the nation’s most fragile and spectacular landscapes. The lawsuit seeks all records from the agency and national refuges that mention border walls, fences, levees or barriers, including emails, meeting notes, presentations, maps and correspondence. The Center requested the documents in July 2017 under the Freedom of Information Act, but the Trump administration has ignored that request. The Center sued the Trump administration and newly confirmed U.S. Interior Secretary David Bernhardt for failing to make protection decisions for 24 species of animals and plants under the Endangered Species Act. The list of wildlife left without protection includes the elfin-woods warbler, Franklin’s bumblebee and tricolored blackbird. They are among hundreds of species awaiting decisions about whether to be protected under the Endangered Species Act or to receive protected critical habitat. The Center and Maricopa Audubon filed a lawsuit in federal district court to compel the U.S. Fish and Wildlife Service to expand critical habitat for Arizona’s highly endangered Mount Graham red squirrel. The Center sued the U.S. Fish and Wildlife Service today for public records on the Trump administration’s decision to allow bee-killing neonicotinoid pesticides and genetically engineered crops on national wildlife refuges. The lawsuit follows an August 2018 decision by the Trump administration to reverse a refuge-protection measurethat prohibited the use of neonicotinoid pesticides and genetically engineered crops that trigger greater pesticide use. The Center and Wild Fish Conservancy sued the Trump administration today for mismanaging West Coast salmon fisheries and harming critically endangered Southern Resident killer whales, a violation of the Endangered Species Act. That orca population has dropped to just 75 individuals, mostly because declining salmon runs have left them without enough to eat. The Center and three other conservation groups filed a lawsuit in federal district court to overturn a key permit for the controversial proposed Rosemont Copper Mine in southern Arizona. The lawsuit challenges the U.S. Army Corps of Engineers’ issuance of a Clean Water Act permit for the mine, which would threaten critical water resources and wildlife habitat. The Center allies sued the U.S. Environmental Protection Agency for failing to enforce air-quality standards designed to protect more than 7 million people in Arizona from harmful particulate pollution. The lawsuit was filed in the U.S. District Court for the Northern District of California in San Francisco, where the EPA’s regional headquarters are located. 116. March 21, 2019 – Why Is Trump Skipping Endangered Species Act Review for Clean Car Rollback? The Center sued the administration for withholding public records related to its decision that its proposal to gut vehicle fuel-efficiency and tailpipe standards does not require Endangered Species Act review. The proposal would radically increase vehicle emissions of greenhouse gases and toxic air pollutants that are a danger to people and wildlife. The Center other conservation groups sued the Trump administration to challenge the Interior Department’s decision allowing additional water to be taken from the Green River below Utah’s Flaming Gorge Dam. The decision was made without a full accounting of reduced Colorado River basin flows or how the region’s persistent drought and climate change could harm endangered species and recreation. The Center and other environmental groups sued the Trump administration to challenge an oil and gas lease sale in the Gulf of Mexico that will open up more than 78 million acres to offshore drilling without fully analyzing the risks to people, wildlife or the environment. The Center filed a pair of lawsuits against the U.S. Environmental Protection Agency, Department of the Interior and Fish and Wildlife Service for violating the Freedom of Information Act by failing to make records available to the public. The lawsuits, filed in federal district court in Washington, D.C., coincide with national Sunshine Week. The Center joined the Native Village of Nuiqsut tribal government and other conservation groups, represented by Earthjustice, in filing a lawsuit challenging the Bureau of Land Management’s approval of ConocoPhillips’ winter exploratory drilling program in the National Petroleum Reserve Alaska, America’s single largest area of public lands. The Center , Defenders of Wildlife and Animal Legal Defense Fund sued the Trump administration over the president’s emergency declaration to pay for his border walls. The lawsuit, filed in U.S. District Court in Washington, D.C., argues that the president is violating the U.S. Constitution by overstepping his executive authority and sidestepping Congress to appropriate more than $6 billion to construct walls along the southern border. The Center sued the Trump administration today for refusing to release public records on its denial of protection for imperiled Pacific bluefin tuna. The Center for Biological Diversity today sued the Trump administration for refusing to release public records related to an enormous plastics plant proposed along the Mississippi River in St. James Parish, La. The area is known as “Cancer Alley” for the high cancer rates among residents. Four conservation and public health groups sued the U.S. Environmental Protection Agency today for approving a permit for a new gas-fired power plant in the Southern California city of Palmdale. The Center and allies filed a lawsuit challenging the U.S. Army Corps of Engineers’ approval of a permit that allows a huge master-planned sprawl development project near Benson, Ariz., to proceed. The Villages at Vigneto would transform 12,167 acres of largely undeveloped habitat into 28,000 residences, 3 million square feet of commercial space, four golf courses, fountains, lakes and a resort. The Center and parter conservationists sued the U.S. Department of Agriculture’s Wildlife Services program over its outdated wildlife-killing plan for Wyoming. The lawsuit seeks an updated environmental analysis of the program, which kills thousands of the state’s native animals every year, primarily killing carnivores like gray wolves and coyotes that are important for balanced ecosystems. The Center filed a lawsuit to force the Trump administration to release emails related to the development of a new, highly controversial management plan for the world’s only population of critically endangered red wolves. The Center sued the Trump administration for failing to protect critical habitat for the northern Mexican garter snake and narrow-headed garter snake. The lawsuit against the U.S. Fish and Wildlife Service, filed in U.S. District Court in Tucson, notes that populations of both snakes occur at low densities or may already be gone in nearly 90 percent of their historic ranges in Arizona and New Mexico. The Center and ally conservation groups filed a lawsuit challenging the Trump administration’s approval of the first offshore oil drilling development in federal Arctic waters. Hilcorp Alaska received approval in October to build and operate the controversial Liberty project, an artificial drilling island and underwater pipeline that risks oil spills in the sensitive Beaufort Sea and threatens polar bears and Arctic communities. The Center and other leading environmental groups sued the federal government to prevent seismic airgun blasting in the Atlantic Ocean. This extremely loud and dangerous process, which is used to search for oil and gas deposits deep below the ocean’s surface, is the first step toward offshore drilling. If allowed seismic airgun blasting would harm marine life, including whales, dolphins, fish and zooplankton — the foundation of the ocean food web. The Center and other conservation groups sued the Trump administration for failing to consider protections for Africa’s rapidly dwindling giraffe population under the Endangered Species Act. The suit challenges the U.S. Fish and Wildlife Service’s refusal to act on an April 2017 petition seeking Endangered Species Act protection for giraffes. The Center for Biological Diversity and Friends of the Earth sued the Environmental Protection Agency for refusing to release public records concerning meetings and communications with the lobbying firm Faegre Baker Daniels, the former employer of EPA Acting Administrator Andrew Wheeler. Five conservation groups, including the Center, sued the Tennessee Valley Authority for imposing discriminatory electricity rates that discourage homeowners and businesses from investing in renewable energy and energy efficiency. The Center sued Interior Secretary Ryan Zinke and the U.S. Fish and Wildlife Service for failing to release public documents about the agency’s move toward stripping Endangered Species Act protections from the American burying beetle. The Center sued the U.S. Fish and Wildlife Service for failing to turn over documents on the impacts of Toyota and Mazda building a massive factory directly adjacent to one of only two populations of the critically endangered spring pygmy sunfish outside of Huntsville, Alabama. The Center sued the Trump administration for failing to protect the West Coast ocean habitat of the last remaining Southern Resident killer whales. The critically endangered species is down to just 75 orcas, the lowest number in more than 30 years.The National Marine Fisheries Service failed to act on our 2014 petition calling for an expansion habitat protections off Washington, Oregon and California that could help Southern Resident killer whales, which are starving for lack of salmon and also being hurt by boat traffic and water pollution. The Center, two other conservation groups, and Boulder County sued the Trump administration today for illegally excluding oil and gas operations in parts of Colorado from a federal project to protect people from smog. The Center and other conservation and animal-protection groups sued the Trump administration for illegally establishing the “International Wildlife Conservation Council,” an advisory panel full of people with personal or financial interests in killing or importing rare animals from overseas. The Center for Biological Diversity, Environmental Defense Fund and Sierra Club filed an emergency motion for a stay or summary reversal of the Environmental Protection Agency’s decision to stop enforcing production caps on super-polluting diesel “glider” trucks. UPDATE:Just days after our motion, the EPA abruptly withdrew its decision to stop enforcing production caps on super-polluting diesel “glider” trucks. The Center and other environmental groups sued the Trump administration for opening up more than 78 million acres of the Gulf of Mexico to offshore drilling without fully analyzing the risks to people, wildlife and the environment. The lease sales targeted in the suit are the largest ever offered for oil and gas development in U.S. history. The Center for Biological Diversity sued the U.S. Fish and Wildlife Service for failing to protect critical habitat for four endangered freshwater mussels that live in 18 different states. The lawsuit noted that the biggest threats to the rayed bean, sheepnose, snuffbox and spectaclecase mussels are habitat loss and fragmentation resulting from dams, development and poor water quality. The mussels occur in New York, West Virginia, Arkansas, Pennsylvania and elsewhere. The Wilderness Society, the Center for Biological Diversity and the Izaak Walton League of America, represented by Earthjustice, filed a lawsuit in federal court in Washington, D.C., to prevent sulfide-ore mining at the edge of the Boundary Waters Canoe Area Wilderness in northeastern Minnesota. Earthjustice, on behalf of the Center and two other conservation groups, sued the Trump administration today for failing to complete a legally required consultation about offshore drilling’s harms to threatened and endangered species in the Gulf of Mexico. The Center for Biological Diversity today sued the U.S. Fish and Wildlife Service for failing to protect critical habitat in West Virginia, Virginia and Kentucky for the Big Sandy crayfish and the Guyandotte River crayfish. The Center and allies sued U.S. Environmental Protection Agency Administrator Scott Pruitt for failing to ensure that Detroit, Indianapolis and other localities that are home to millions of people have effective plans for cleaning up asthma-causing sulfur dioxide air pollution. The lawsuit points out that the EPA has already determined that these 17 areas in 10 states have sulfur dioxide pollution at levels high enough to cause human health problems and to harm fish and forests. The polluted areas are in Arizona, Florida, Indiana, Iowa, Michigan, Missouri, New Jersey, Ohio, West Virginia and Wisconsin. The Center and ally conservation groups filed a lawsuit challenging two regulations that weaken Clean Water Act protections for rivers, streams, wetlands and other waterways, including a Trump administration decision to delay the 2015 Clean Water Rule for two years. The Center sued the Fish and Wildlife Service for failing to protect critical habitat for the spring pygmy sunfish under the Endangered Species Act. The lawsuit, filed in the U.S. District Court in Washington, D.C., emphasizes that the spring pygmy sunfish has been driven locally extinct in two of three springs it was known to occupy. The Center and other groups sued the Trump administration and EPA Administrator Scott Pruitt for failing to protect endangered wildlife and the environment from the dangerous pesticide malathion. The lawsuit, filed in the U.S. District Court for the Northern District of California, alleges that the EPA and the U.S. Fish and Wildlife Service have failed to complete the legally required steps to fully assess and limit the dangers of the neurotoxin. Malathion is linked to developmental disorders in children and has been found by the World Health Organization to be probably carcinogenic to humans. Last year EPA scientists determined that the pesticide, manufactured by Dow Chemical, poses widespread risks to protected plants and animals. A coalition of national environmental groups, including the Center, filed litigation in the Southern District of New York challenging the Trump administration's move to eliminate longstanding protections for waterfowl, raptors and songbirds under the Migratory Bird Treaty Act (MBTA). Groups filing the litigation, National Audubon Society v. Department of the Interior, also included the American Bird Conservancy, Defenders of Wildlife, National Audubon Society, National Wildlife Federation and the Natural Resources Defense Council. The Center and allies (the San Juan Citizens Alliance, Amigos Bravos and the Sierra Club) joined Diné CARE in filing a legal challenge over the future of a controversial power plant on the Navajo reservation, the Four Corners Generating Station. Our challenge declares that the Environmental Protection Agency failed to update a water-pollution permit for the power plant. At the time of the suit, the EPA had last issued a National Pollutant Discharge Elimination System permit for Four Corners in 2001, which expired more than 12 years before. Meanwhile, our challenge states, the plant has been dischargingp pollutants including copper, iron and chlorine. The Center filed a lawsuit today over the U.S. Fish and Wildlife Service's unlawful delay in deciding whether to extend Endangered Species Act protection to the San Joaquin Valley giant flower-loving fly. The hummingbird-like fly has been extirpated from more than 99 percent of its former range, with only one remaining population about 15 miles east of Bakersfield, where it is under immediate threat of extinction from sand mining. There may be just a few hundred left. The Center and ally conservation groups filed a lawsuit challenging Trump administration policies that gut protections for imperiled greater sage grouse and allow oil and gas leases on nearly 2 million acresof the birds' prime habitat. The suit, filed in U.S. District Court in Boise, says the Interior Department's Bureau of Land Management violated the National Environmental Policy Act and Federal Lands Policy and Management Act when it approved eight massive oil and gas lease sales in Nevada, Utah, Montana, Wyoming and Idaho. Those leases were enabled by two Trump polices, one directive rolling back hard-won compromises to preserve dwindling sage-grouse populations across the West and another that cuts the public out of oil and gas planning on public lands. The Center and other groups sued Interior Secretary Ryan Zinke and the Bureau of Land Management for approving new leases to allow fracking on more than 45,000 acres in western Colorado, including within communities and within a half-mile of a K-12 public school, without analyzing or disclosing environmental and public health threats as required by federal law. 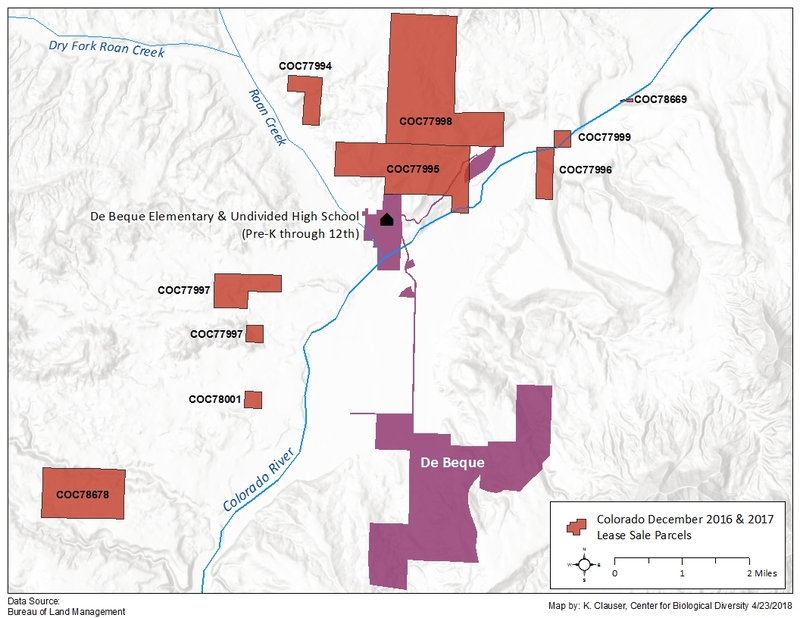 The lawsuit, filed in U.S. District Court in Denver, challenges leases in and around the towns of De Beque, Molina and Mesa on the western slope of the Rocky Mountains. The Center sued the Fish and Wildlife Service for failing to protect the rare Tinian monarch songbird under the Endangered Species Act. The lawsuit, filed in the U.S. District Court in D.C., notes that this small bird lives only on Tinian, a 39-square-mile island in the western Pacific Ocean that is part of the Commonwealth of the Northern Mariana Islands. The bird is severely threatened by plans to expand military-training activities in the monarch's last remaining forest habitat. The Center sued the Department of the Interior for failing to provide public records on Deputy Secretary David Bernhardt's communications and schedules. These records could shed light on the Trump administration's abrupt decision to allow an enormous California groundwater-mining scheme, Cadiz, Inc., to move forward without environmental review. The suit also seeks the communications and schedules of Todd Willens, assistant deputy secretary, who is believed to oversee endangered species, water management and energy under Interior Secretary Ryan Zinke. The Center filed suit against the Fish and Wildlife Service for failing to protect two imperiled aquatic species in eastern North Carolina under the Endangered Species Act. Our lawsuit, filed in U.S. District Court for the Eastern District of North Carolina, seeks protection for the Carolina madtom, a small catfish fighting for survival in the Tar River basin, and the Neuse River waterdog, a permanently aquatic salamander found only in the Neuse and Tar-Pamlico river basins. The Center filed suit in federal court to force the Trump administration to show how it will protect eight congressionally designated "wild and scenic" Southern California rivers, which wind though three national forests and other public lands and provide habitat for imperiled fish, birds and other wildlife. In August of the same year, the Trump administration agreed to a settlement with the Center requiring two federal agencies to prepare long-overdue management plans to protect the eight rivers. The Center and allies sued the Trump administration to challenge its waiver ignoring 25 laws to speed construction of 20 miles of border wall in eastern New Mexico, an area that's home to rare wildlife in one of the world's most biodiverse deserts. The Center and other conservation groups sued the Trump administration for failing to follow federal law and ban shrimp and other seafood imported from Mexico's Upper Gulf of California and harvested with gillnets that drown the vaquita porpoise. The lawsuit, filed in the U.S. Court of International Trade in New York, N.Y., notes that fewer than 30 vaquita now remain. Vaquita reside in only one place on the planet: the Gulf of California, a narrow body of water between Baja and the Mexican mainland. Fishing with gillnets is driving the vaquita to extinction because the small porpoise is easily entangled and drowned in these dangerous nets. The Center for Biological Diversity and Appalachian Mountain Advocates sued the U.S. Fish and Wildlife Service for refusing to release public records concerning coal mining and endangered species in West Virginia. The lawsuit, filed in the U.S. District Court for the Northern District of West Virginia, demands records related to Endangered Species Act compliance for mines that could harm the Big Sandy crayfish and Guyandotte River crayfish. The suit comes after the Service failed to respond to Freedom of Information Act requests by the required deadlines. The Center for Biological Diversity, Turtle Island Restoration Network and Wishtoyo Foundation sued the Trump administration for failing to protect humpback whale habitat in the Pacific Ocean, where the animals face threats from fisheries, ship strikes and oil spills. The lawsuit, filed in federal district court in San Francisco, aims to force the National Marine Fisheries Service to follow the Endangered Species Act's requirement to designate critical habitat within one year of listing a species as threatened or endangered and not authorize actions that would damage that habitat. Two Pacific Ocean humpback populations were listed as endangered and a third as threatened in September 2016. Read more. The Center sued the U.S. State Department for refusing to release public records regarding the overdue seventh U.S. Climate Action Report. The deadline to submit the report to the United Nations Framework Convention on Climate Change Secretariat passed on Jan. 1. The Center fand partner conservation and animal-protection organizations sued the Fish and Wildlife Service for funding a Colorado Parks and Wildlife plan to kill hundreds of mountain lions and dozens of black bears without analyzing the risks to the state's environment. The Center sued the Trump administration for denying Endangered Species Act protection to Pacific walrus. The lawsuit is being filed just as Arctic sea ice coverage is hitting a record low. The Fish and Wildlife Service found in 2011 that the walrus warranted protection because climate change is destroying the sea ice it needs to survive. But a few months after Trump took office, the agency reversed course and found the species no longer merits protection. The Center sued the U.S. Fish and Wildlife Service over the lack of protections for the streaked-horned lark, a songbird with distinctive feathered horns that has undergone massive declines across its range in western Oregon and Washington. The lawsuit challenges the agency's October 2013 decision to protect the lark as "threatened" rather than the more protective "endangered" status and to create a "4(d) rule" that exempts all agriculture and airport activities from the prohibitions of the Endangered Species Act, regardless of whether they harm the lark. The Center sued the Trump administration for illegally withholding public records documenting the widespread harm to endangered species posed by chlorpyrifos and two other pesticides, diazinon and malathion. In response to the Center's June 2017 request for the public records, the Environmental Protection Agency and Fish and Wildlife Service have failed to release any of the likely thousands of pages of crucial analysis conducted by the two agencies. The Center for Biological Diversity, Gulf Restoration Network and Louisiana Bucket Brigade sued the Trump administration for permitting oil companies to dump waste from fracking and drilling into the Gulf of Mexico without evaluating the dangers to water quality, marine species or the environment. Conservation and environmental groups, including the Center, filed a lawsuit to protect the nation's largest public lands reserve from oil and gas industrialization. The Trump administration's plans for a dramatic and reckless increase in oil and gas drilling in the Western Arctic would threaten core wildlife values and accelerate the impacts of global climate change, at a time when a transition to clean energy alternatives is urgently needed. The Center and ally conservation groups sued the Trump administration to prevent a land swap that would allow construction of a road through the heart of Alaska's Izembek National Wildlife Refuge. Izembek is one of America's most ecologically significant wildlife refuges, home to world-class wetlands that support millions of migrating birds, as well as bears, caribou and salmon. The Center for Biological Diversity sued the Trump administration's Environmental Protection Agency for delaying, by two years, new limits on cancer-causing water pollution from coal-burning power plants. The lawsuit was filed in U.S. District Court in Tucson, Ariz. The unlawful delay of the EPA's 2015 Clean Water Act effluent-limitation rule would allow coal plants to continue discharging toxic pollutants like arsenic, mercury and lead known to be extremely harmful to the health of humans and fish. The Center and allies in a coalition of wolf advocates filed a lawsuit challenging the Trump administration's deeply flawed recovery plan for the Mexican gray wolf, one of North America's most endangered mammals. The Center for Biological Diversity, as part of a coalition of environmental and tribal groups, sued to block the Trump administration's repeal of a 2015 rule designed to protect water, wildlife and public health from the harmful effects of hydraulic fracturing on federal and tribal lands. The Center and other conservation and animal-protection groups sued the National Marine Fisheries Service for failing to prevent critically endangered North Atlantic right whales from becoming ensnared by lobster trap lines and other commercial fishing gear. Scientists have found that entanglement is the leading cause of death for right whales, which have suffered an alarming die-off over the past year, overwhelming recovery efforts. The Center and other conservation groups filed a lawsuit against the Trump administration for failing to respond to their emergency request to ban certain seafood imports from Mexico's Gulf of California in order to save the critically endangered vaquita porpoise from extinction. The suit was filed with fewer than 30 vaquitas remaining on the planet after their population suffered a 95 percent decline over the past 20 years. Entanglement in fishing gillnets is the sole threat to the species survival. Scientists predict that the vaquita will be extinct by 2019 if fishing practices remain unchanged. The Center and allies filed a lawsuit against U.S. Environmental Protection Agency Administrator Scott Pruitt for failing to enforce air-quality standards that limit deadly soot pollution. The lawsuit seeks to force the EPA to ensure that communities in California, Idaho and Pennsylvania are taking legally required steps to meet clean-air standards to reduce soot, also known as fine particulate matter. The suit was filed in U.S. District Court for the Northern District of California. The Center and other government-watchdog groups sued the Trump administration for trying to suspend a federal rule aimed at curbing methane waste and pollution — the Methane Waste Prevention Rule, which would reduce waste of publicly owned natural gas by oil and gas companies — even after defeats in court and in Congress. The Center and ally environmental groups — plus three public-health advocacy organizations — filed a lawsuit against the U.S. Environmental Protection Agency for failing to enact nationwide standards limiting deadly ozone pollution. The Trump administration violated the Clean Air Act when the EPA missed an Oct. 1 deadline to designate major metropolitan areas and rural regions across the country as out of compliance with clean air regulations. The Center and other conservation groups sued the Trump administration to stop imminent expansion of the West Elk coal mine into roadless wildlands on the Gunnison National Forest. The lawsuit seeks a court order to prevent St. Louis-based Arch Coal from starting exploratory drilling and road construction as soon as today on pristine public lands on Colorado's West Slope. The Center for Biological Diversity, Tropical Audubon Society, Miami Pine Rocklands Coalition and South Florida Wildlands Association sued the Trump administration for approving Coral Reef Commons, a mega-development slated for the largest privately owned tract of critically endangered pine rocklands habitat in Miami-Dade County. The development would impact 20 endangered plants and animals, including the eastern indigo snake, gopher tortoise, Florida brickell-bush and two butterflies, the Bartram's scrub-hairstreak and Florida leafwing. Several of these species are limited to the last few tracts of pine rocklands in South Florida. UPDATE: The Parties reached a resolution where the developer agreed to expand and enhance the protected areas and make a significant financial contribution to Miami-Dade County’s Environmentally Endangered Lands Program. Three days after President Donald Trump issued a proclamation taking an ax to Bears Ears National Monument in southern Utah, the Cetner and eight other conservation organizations filed a lawsuit attacking the order as an abuse of the president's power. Following in the footsteps of the American Indian tribes who have already sued the president, Earthjustice is representing the organizations in a suit charging that the president violated the 1906 Antiquities Act and the U.S. Constitution by eviscerating the monument. Hours after Trump issued a proclamation taking an axe to Grand Staircase-Escalante National Monument in Utah, the Center and seven ally groups filed a lawsuit attacking the order as an abuse of the president's power. Earthjustice is representing the eight organizations in our suit charging that the president violated the 1906 Antiquities Act by stripping monument protections from this national treasure: The Wilderness Society, the Grand Canyon Trust, the Sierra Club, Defenders of Wildlife, Great Old Broads for Wilderness, the Center for Biological Diversity, WildEarth Guardians and Western Watersheds Project. The Southern Utah Wilderness Alliance and Natural Resources Defense Council are co-plaintiffs in the lawsuit and represented by in-house counsel. The Center sued the Environmental Protection Agency for refusing to release public records regarding Administrator Scott Pruitt's directive that limits the agency's ability to settle lawsuits — even when delays in resolving a case result in significant environmental harm. The Center and other green groups filed suit in federal court challenging the Trump administration's approval of an enormous groundwater-mining and pipeline project in Southern California. The Cadiz water project, approved without environmental review, includes the construction of a pipeline through the Mojave Trails National Monument and other public lands in the area. The Center for Biological Diversity, Save the Scenic Santa Ritas, the Arizona Mining Reform Coalition and the Sierra Club's Grand Canyon Chapter filed a lawsuit in federal court to overturn the U.S. Forest Service's approval of a controversial open-pit copper mine in southern Arizona's Santa Rita Mountains. The suit, filed in U.S. District Court, says the massive Rosemont Copper Mine would violate nearly a dozen state and federal laws, threaten critical water resources and destroy Coronado National Forest land. The Center and Natural Resources Defense Council sued the Trump administration today for allowing U.S. hunters to import elephant and lion trophies from Zimbabwe. The lawsuit aims to protect animals and resolve confusion created by the administration's recent contradictory announcements. The suit came days after the Fish and Wildlife Service abruptly reversed an Obama-era ban on elephant trophy imports based on catastrophic elephant population declines. Fish and Wildlife also recently greenlighted lion trophy imports from Zimbabwe, despite the controversial killing of Cecil the Lion in Zimbabwe in 2015. Read more about our lawsuit update in March 2018. 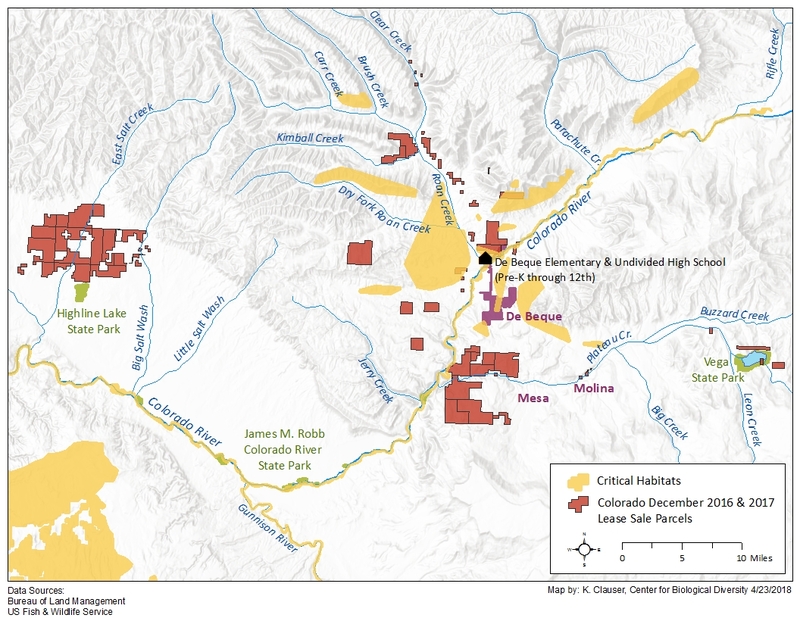 The Center and allies filed a complaint challenging a 146-natural-gas-well master development plan, by the U.S. Bureau of Land Management, sited 30 miles northeast of Paonia, Colorado, in the Bull Mountain Unit. The groups in the coalition filing the lawsuit is comprised of four citizen and conservation groups (including the Center) representing local farmers, ranchers, vineyards, wineries, recreationalists, property owners, residents and local businesses. The suit seeks declaratory and injunctive relief for the BLM's failure to include a reasonable range of alternatives to its plan and/or take a hard look at the proposal's cumulative impacts under the National Environmental Policy Act. The Center sued the Trump administration for refusing to release public records about its sudden termination this summer of a federal climate advisory committee. The expert committee was working in support of the next National Climate Assessment, a congressionally mandated scientific report on global warming's threats to the United States. The Center and partner conservation and public-health groups filed a lawsuit to force the Environmental Protection Agency to ensure that Alabama and Mississippi have measures prohibiting conflicts of interest on state boards overseeing air pollution permits. The two states had been violating conflict-of-interest requirements for nearly 40 years. The Center filed suit in U.S. District Court to challenge a controversial open-pit copper mine in the Santa Rita Mountains of southern Arizona that would destroy prime jaguar habitat. The lawsuit challenges the "biological opinion" prepared by the U.S. Fish and Wildlife Service, which led to the approval of the Rosemont Mine by the U.S. Forest Service in June. The Center for Biological Diversity and the Sierra Club filed a lawsuit challenging the Bureau of Land Management's June sale of oil and gas leases in northern Nevada. On June 14, the BLM offered nearly 200,000 acres of public lands in Nevada's Battle Mountain district for fossil fuel development, including fracking. The lawsuit argues the BLM failed to consider the potential consequences of oil drilling in the area, from contamination of critical desert water sources to emission of climate-altering greenhouse gases. The Center and allies filed a lawsuit to overturn the Trump administration's indefinite delay of higher penalties for new cars and trucks that do not meet minimum fuel-economy standards, with automobiles currently America's largest source of carbon pollution. The suit, filed in the 2nd U.S. Circuit Court of Appeals, challenges a July decision by the National Highway Traffic Safety Administration to suspend a 2016 rule that increased penalties for new vehicles failing to meet fuel-economy standards. A coalition of tribal and conservation interests, including the Center, filed a lawsuit in federal court seeking to restore critical protections to the Yellowstone region's iconic grizzly bears before new threats, including hunting, push the population further into decline. The suit challenges a June 2017 decision by the U.S. Fish and Wildlife Service to remove the Yellowstone-area grizzly population from the list of species protected by the Endangered Species Act, which enables the states of Idaho, Montana and Wyoming to move ahead with plans for trophy hunting of grizzlies. The Center filed suit against the U.S. Fish and Wildlife Service over its program allowing the export of tens of thousands of wild animals trapped and killed for the international fur trade. The Service's program covers five “furbearing” species, including bobcats, river otters, wolves, lynx and brown bears, representing the deaths of about 80,000 individual animals annually in recent years. The Center sued the Trump administration under the Freedom of Information Act to obtain public records on the approval of nationwide water-quality criteria for the dangerous heavy metal cadmium that are nearly 40 percent higher than determined to be safe for endangered salmon. The Center and other environmental nonprofits sued the U.S. Department of Agriculture's Wildlife Services program over its outdated wildlife-killing plan for Northern California. The lawsuit, filed in San Francisco federal court, seeks an updated environmental analysis of the program's killing of native wildlife including coyotes, bobcats and foxes. The Center sued the Trump administration for public records of closed-door meetings between the Bureau of Land Management and industry executives over the reversal of the Obama administration's “pause” on coal extraction on federal public lands. UPDATE: The next month the Center ammended our suit. The Center sued the U.S. Department of Homeland Security and U.S. Customs and Border Protection for failing to provide environmental documents required for the construction of border wall “prototypes” in San Diego County. The the Center for Biological Diversity and Center for Environmental Health sued Environmental Protection Agency Administrator Scott Pruitt for delays in reducing dangerous ozone pollution in the Sacramento area and parts of Los Angeles, Riverside and San Bernardino counties. The lawsuit, filed in federal district court, demands that the EPA enforce deadlines to ensure that areas violating air-quality standards have plans in place to clean up their skies. The Center sued the Trump administration for public records of closed-door meetings between the U.S. Environmental Protection Agency, states and industry groups over weakening wetlands protections under the Clean Water Act. President Trump directed the EPA to rewrite regulations determining whether wetlands are protected as “waters of the United States” under the Clean Water Act. Trump's executive order could potentially eliminate Clean Water Act protections for millions of acres of wetlands, which are critical to water purification, ecosystem health and habitat for hundreds of endangered species. The Center filed suit against the Army Corps of Engineers and U.S. Customs and Border Protection Agency for failing to provide briefing materials prepared for Trump's transition team that discuss construction of a wall along the U.S.-Mexico border. We requested the materials in January under the Freedom of Information Act. The documents may contain discussion of the feasibility, effectiveness or impacts of building Trump's wall. But so far the agencies have failed to provide the records. The Center sued the Trump administration to uncover public records showing that federal employees have been censored from using words or phrases related to climate change in formal agency communications. The lawsuit, filed in U.S. District Court in Washington, D.C., seeks to require four federal agencies to release climate-censorship records, in compliance with the Freedom of Information Act. The Department of Energy, Environmental Protection Agency, Department of the Interior and Department of State have failed to provide records requested by the Center or indicate when they might do so, violating deadlines established under the law. The Center for Biological Diversity and Thomas Bachand filed suit against the U.S. Department of State to obtain information on the route of the Keystone XL Pipeline, as well as contracts and correspondence with private consultants involved. The State Department is required to make public information about the route of the pipeline and related documents under the Freedom of Information Act. We expanded our lawsuit a few days after filing it (on May 23), adding a new claim highlighting the proposed pipeline project's threats to critically endangered whooping cranes and other threatened species. The Center and parter green groups filed a lawsuit in federal court today to stop the U.S. Department of Agriculture's wildlife-killing agency from shooting, trapping, and poisoning Idaho's wild animals. In the suit, Western Watersheds Project, WildEarth Guardians, the Center for Biological Diversity and Predator Defense — represented by Advocates for the West and a staff attorney at Western Watersheds Project —assert that Wildlife Services has written itself a broad, statewide authorization to kill native predators like coyotes and mountain lions, along with ravens and other animals, without taking a hard look at the impacts of its unscientific slaughter. The Center and other conservation groups, along with Alaska Native groups, filed a lawsuit against President Trump challenging his decision to jettison a permanent ban on new offshore oil and gas drilling in the Arctic and Atlantic oceans. The Center filed suit to force the U.S. Environmental Protection Agency to turn over the emails and schedule of the agency's administrator, Scott Pruitt. The Cetner and other conservation groups filed a lawsuit against EPA Administrator Scott Pruitt for his failure to finalize deadlines by which the District of Columbia and Philadelphia must meet 2008 clear-air standards to control smog. Smog — also known as ground-level ozone pollution — poses serious threats to public health, wildlife and ecosystems. The Center and environmental allies sued the U.S. Forest Service and U.S. Bureau of Land Management over plans to permit fracking in Ohio's only national forest, the Wayne, aiming to void BLM leases and halt fracking in the national forest. The lawsuit charges that the agencies failed to analyze threats to public health, endangered species and the climate before auctioning off more than 670 acres of forest land for large-scale, high-volume fracking. In the first constitutional challenge of its kind, the Center sued the Trump administration for repealing protections for wolves, bears and other wildlife on Alaska's national wildlife refuges. The Center partnered with Arizona Congressman Raúl M. Grijalva, ranking member of the House Committee on Natural Resources, to sue the Trump administration over the proposed border wall and other border security measures — filing the first lawsuit targeting the Trump administration's plan to vastly expand and militarize the U.S.-Mexico border. Three months later — on July 10, 2017 — we expanded our border wall prototype lawsuit to include the proposed replacement of a 14-mile segment of the border wall. Read more about the lawsuit expansion. The Center and other conservation groups filed a lawsuit against the U.S. Department of Agriculture's Wildlife Services over its carnivore-killing program in Colorado, including controversial plans to kill as many as 120 mountain lions and black bears in the state — with fully analyzing the program's environmental impacts. The Center and three ally environmental groups sued the Trump administration for failing to protect endangered species from two deadly pesticides used to kill coyotes and other native carnivores: Compound 1080 and sodium cyanide, both used in M-44s — also known as “cyanide bombs.” Cyanide bombs had killed an Oregon wolf in February and in March temporarily blinded a child and killed three family dogs in two separate incidents in Idaho and Wyoming. The Center, Friends of the Earth and other environmental groups sued the Trump administration for approving the controversial Keystone XL pipeline with no public input on the decision and despite the project's serious threats to air, water, wildlife and public health — a violation of the National Environmental Policy Act. In November 2017 a federal judge ruled to allow our laswsuit to proceed, rejecting attempts by the Trump administration and TransCanada (the company behind the proposed pipeline) to have the suit thrown out. The Center and six other conservation groups filed suit against the Trump administration over Interior Secretary Ryan Zinke's order opening tens of thousands of acres of public lands to the coal industry — a day after the president's executive order rolling back protections for public health, the climate and the environment. The Center, Earthworks and Save Our Sky Blue Waters filed suit against the U.S. Fish and Wildlife Service and U.S. Forest Service for their approval of the PolyMet 528-acre open-pit copper mine in Minnesota's Superior National Forest. The mine would destroy important habitat for gray wolves and Canada lynx, both protected by the Endangered Species Act. Minnesota Center for Environmental Advocacy, the Center for Biological Diversity and the W.J. McCabe Chapter of the Izaak Walton League filed a separate suit over the PolyMet mine, in this case to overturn the Forest Service's decision to approve the largest land exchange in its history. The land exchange would give PolyMet thousands of acres of critically important wetlands in Superior National Forest, where mining operations would forever destroy the wetlands that form the headwaters of the St. Louis River. The Center sued the Fish and Wildlife Service to end use of agricultural pesticides known to harm people and wildlife on the Tule Lake and Lower Klamath national wildlife refuges. In adopting a comprehensive conservation plan to guide management of the refuges over the next 15 years, the Service failed to consider alternatives that would reduce or eliminate use of toxic pesticides, prioritizing commercial agricultural interests over wildlife. The Center — along with farmers, other conservation groups and food- and farm-justice organizations — sued the U.S. Environmental Protection Agency for approving Dow AgroScience's highly toxic Enlist Duo, a novel mixture of the weed-killing chemicals glyphosate and 2,4-D posing extensive risk to rural communities, food supplies and the environment. The Center and three other environmental organizations sued the U.S. Army Corps of Engineers and Fish and Wildlife Service for authorizing the use of 50,000 acres for phosphate strip mining that would irreversibly destroy native plant and animal habitat in central Florida. The lawsuit aims to prevent mining that would threaten water quality and quantity by obliterating wetlands and habitat for animals already clinging to survival. Your support is crucial to our fight to save species.